For the record, I waffled between the House of Pain lyric in my subtitle versus “Rasham-a-lamma ding-dong.” (By Otis Day And The Knights, a fictional band created for Animal House.) But really, Irish Bostonians or fake black doo-woppers have nothing to do with Pakistani cuisine. Which somehow makes sense since I have no knowledge or authority to write about Pakistani cuisine. 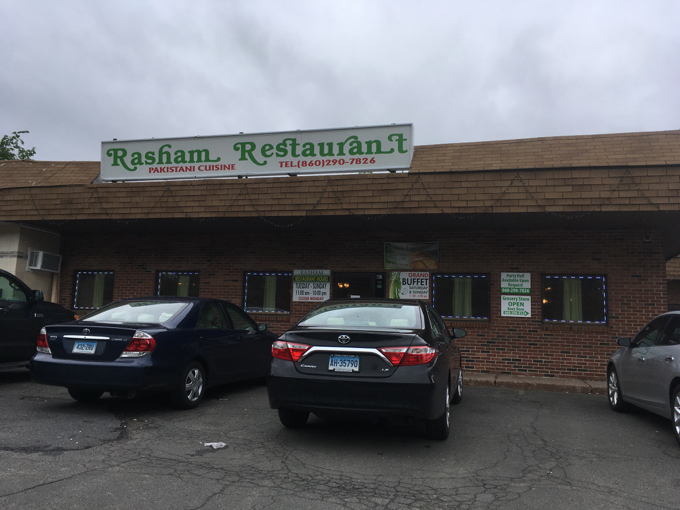 Heck, before I began tackling South Windsor, I had no idea we had restaurants billing themselves as Pakistani in Connecticut. 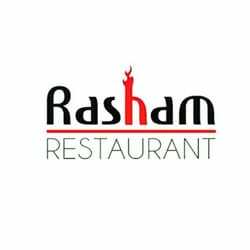 I’m sure there are others beyond Rasham, and raShame on me for not being aware of them, but I like Rasham, so Rasham it is. 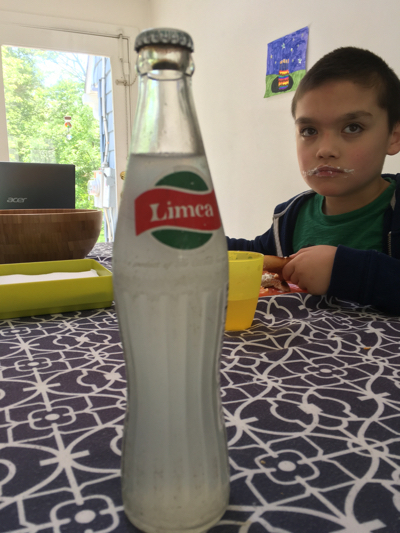 Rasham-a-lama… I’m a ding-dong. 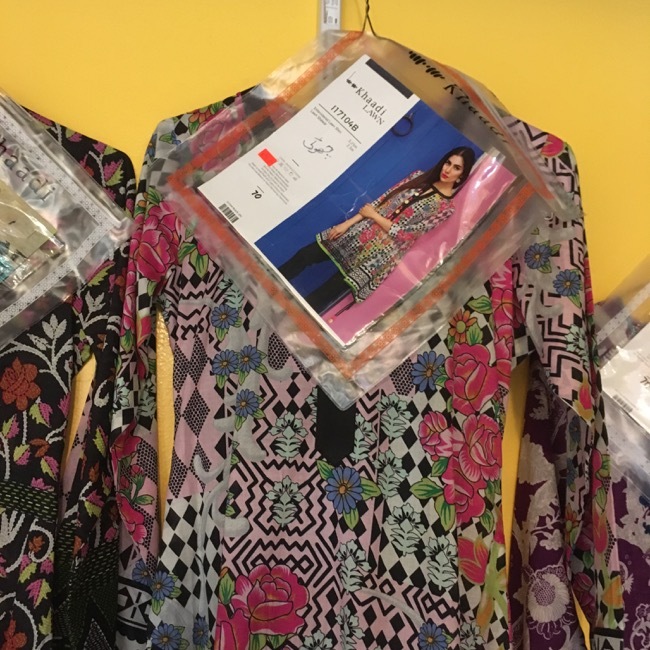 I should note up front that between the time I first went to Rasham and am writing this – only a few months – they must have hired some kid with social media experience. They suddenly have a coherent facebook page, a good enough Instagram feed, and even a little website. Granted, that site is just their menu, but still. It’s a start. Way back three months ago or so, they had nothing. Rasham is on the rise. A couple of the guys there are really handsome too… not quite Tangiers-in-Hartford handsome, but still handsome nonetheless. I calls ’em as I sees ’em. I’m not RaShamed. 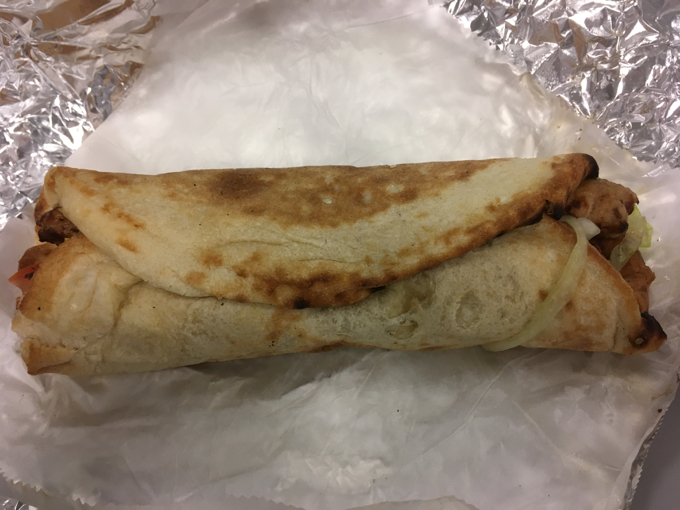 To me, an Anglo-Saxon suburban dad, the most important thing I discovered at Rasham is, without a doubt, the pure genius of the naanwich. WHY ISN’T THIS A THING EVERYWHERE?! I’ve said it a million times: my favorite food is perfect fresh-baked bread of several varieties. Baguettes, loaves, croissants, and naans. 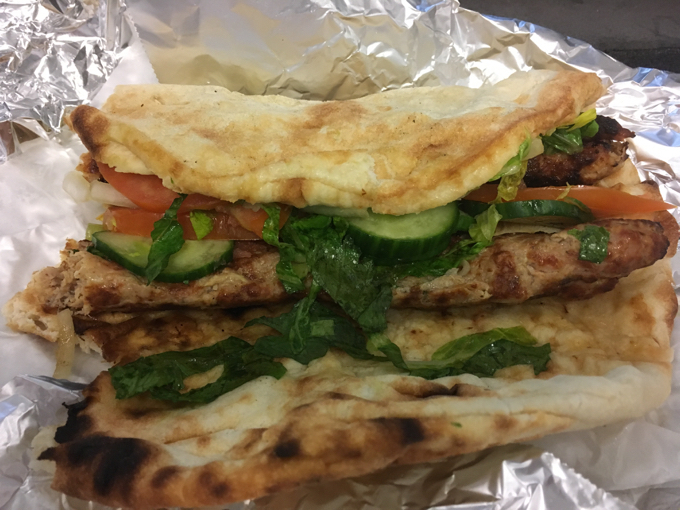 So a sandwich on naan is just… wonderful. They have a few different types available. I went with the Chicken Tikka Naanwich and it was as good as I had hoped it would be. 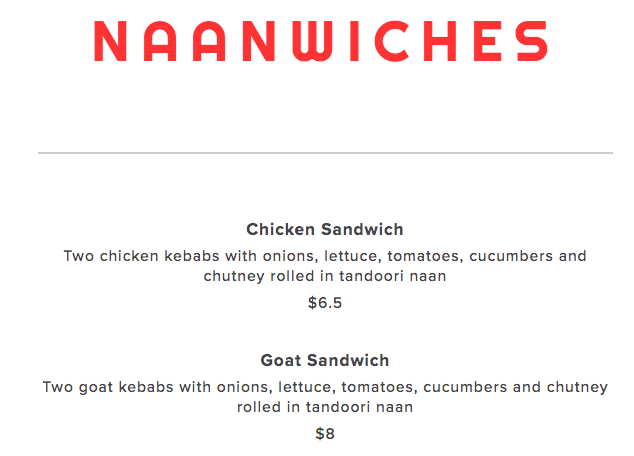 I actually wanted to try the goat sandwich naanwich because then I can die telling people I’ve eaten a goat sandwich, but the time I tried to get it, the wait was way too long for me. Pakistanis love goat; I know that now. 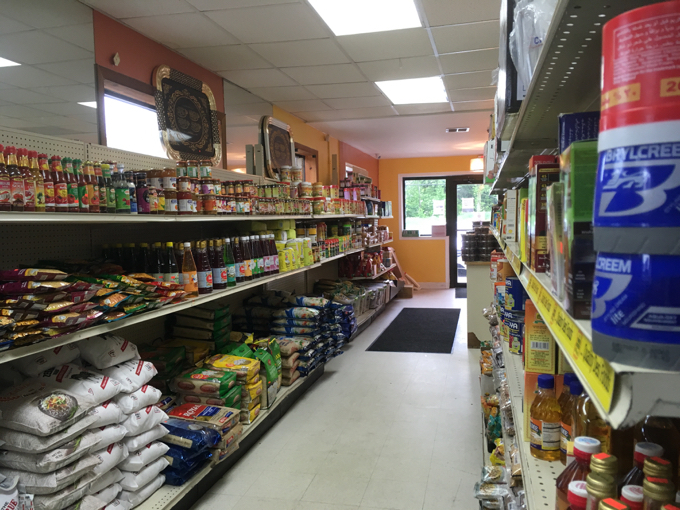 As I waited for my first naanwich, I was able to poke around the Rasham store that is attached to the restaurant. 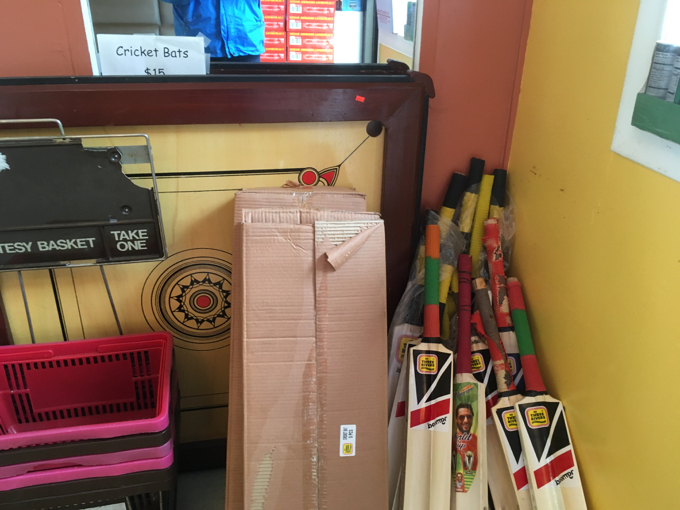 It’s small, but claims to provide all the necessary items for any self-respecting Pakistani kitchen. Not bad. 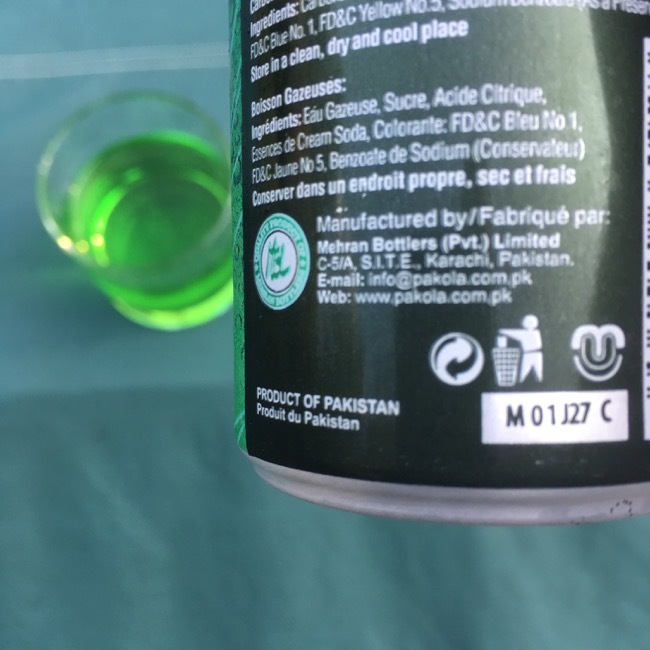 A fruity soft drink that is made in England but has recently been outsourced to Pakistan, Saudi Arabia, and Gambia. Steel caps and lots of time waiting to be bought equals rusty glass. Eh, no big deal. What’s next? This is a non-alcoholic malt beverage. 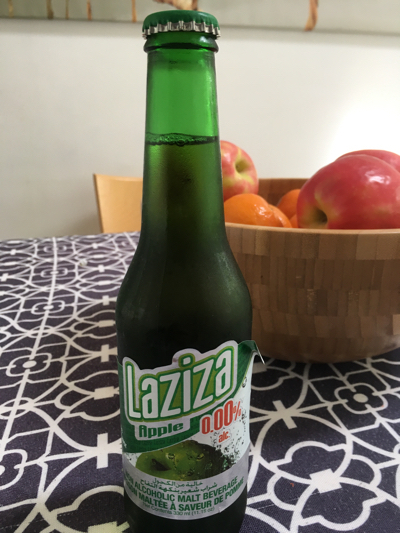 It is made in Lebanon and weirdly marketed as a “beer alternative.” It does not taste like beer or any beer-like beverage. Yet, it is rated on all the beer rating sites out there for some reason. I rather hated this stuff. Who remembers Aspen, the apple soda of my youth? My granny used to have that crap available all the time and I hated it so much. Fake apple flavor is the worst. 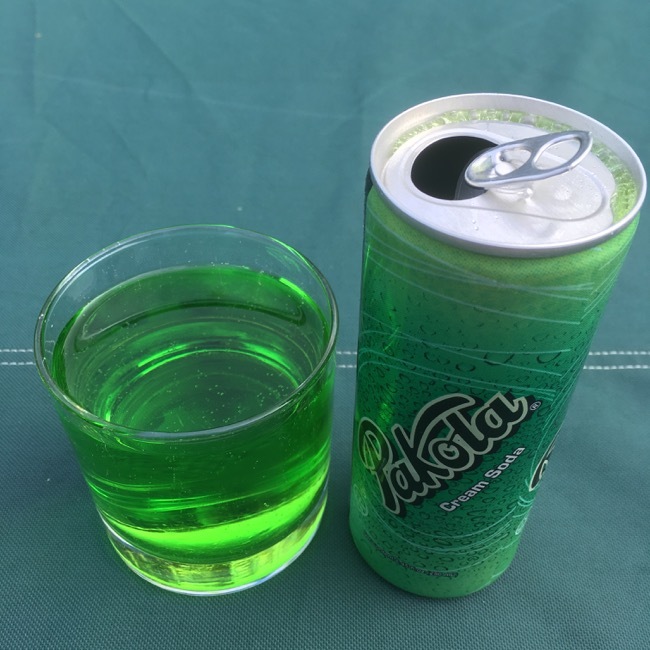 It’s radioactive green? 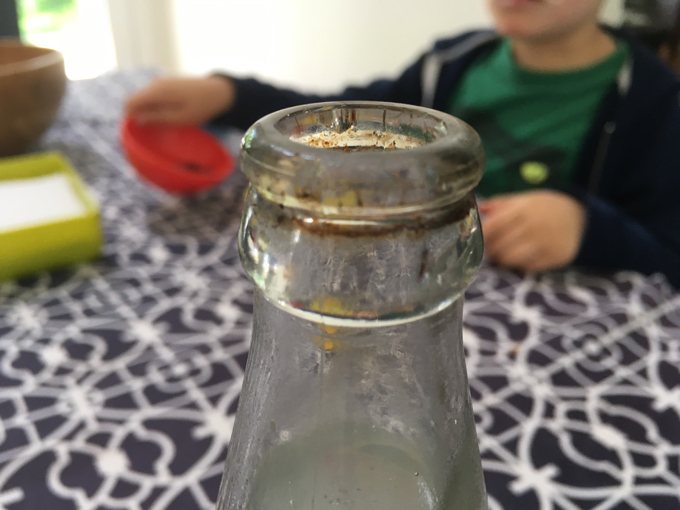 Cream soda? Huh? 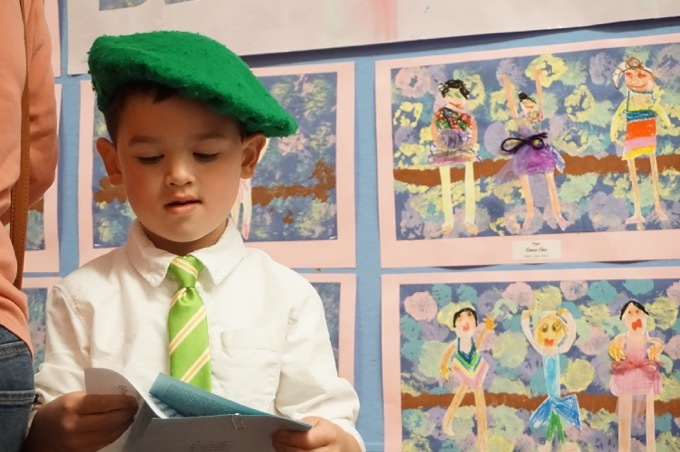 I read that it is bright green to match the bright green of the flag of Pakistan. I’ve read that some people mix it with milk. 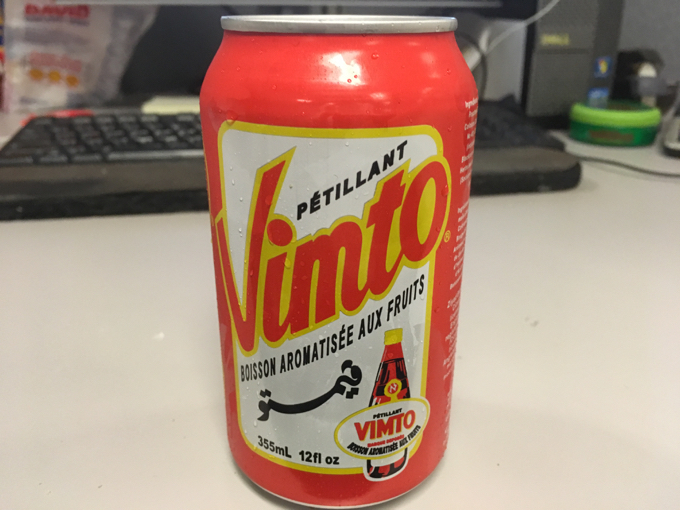 Aside from whatever this color does to one’s innards, I didn’t think it was too bad and honestly, south Asian soft drinks are better than southeast Asian soft drinks in my opinion. Ah, my naanwich was ready. So exciting! As I said, I went with the Chicken tikka version and it did not disappoint. I’ll admit, there’s a bit of a “mystery meat” feeling when eating tube-meat. This thing didn’t really taste like chicken at all, but I didn’t care. All the delicious flavors I was familiar with from Indian cuisine were there – the garam masala, garlic, ginger, cumin, cayenne… cut nicely by the fresh cucumbers, tomatoes, and lettuce. And yes, the naan bread was perfect. One of the best $6 lunches you’ll find in Hartford County. Even better, a guy working there saw me staring at the tray of “weird” looking dessert things. He offered me one and I said okay. I hate food photography, because in the hands of amateurs like me, it’s almost never fair to the restaurant. He told me the Pakistani name for it, and then said the Persian name for it. I got the idea he was from Iran. He seemed quite excited for my jalebi/zulbia experience. Yeah. Well, I’m glad I didn’t eat it in front of him. 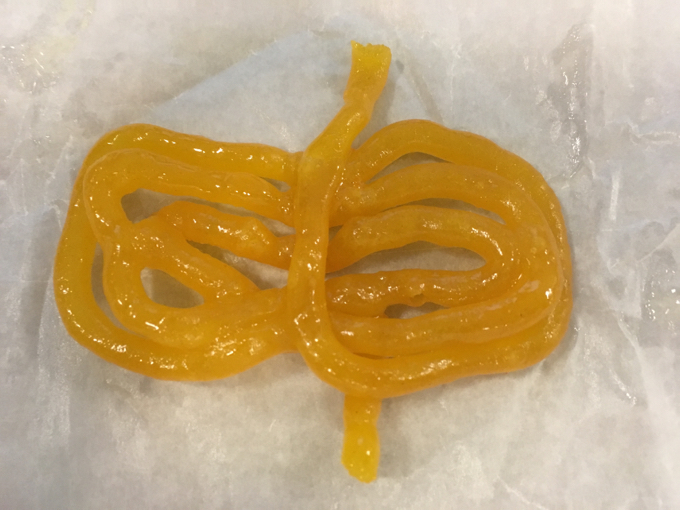 Jalebi (zulbia in Iran) is simply friend dough bathed in TONS of sugar. Maybe some honey. I think probably some rose water was used as well. I couldn’t choke down more than two bites. Undeterred, I returned a couple months later for a quick $11 buffet lunch. I’m familiar with this set-up from Indian restaurants and must admit some slight disappointment at the limited fare on offer. But then I piled up my plate and forgot all about that. After all, what else would I want to eat anyway? I got my four slabs of naan fresh off the grill, a pile of steaming chicken biryani; the large basmati rice grains fluffed up nicely to soak in the complex spices. 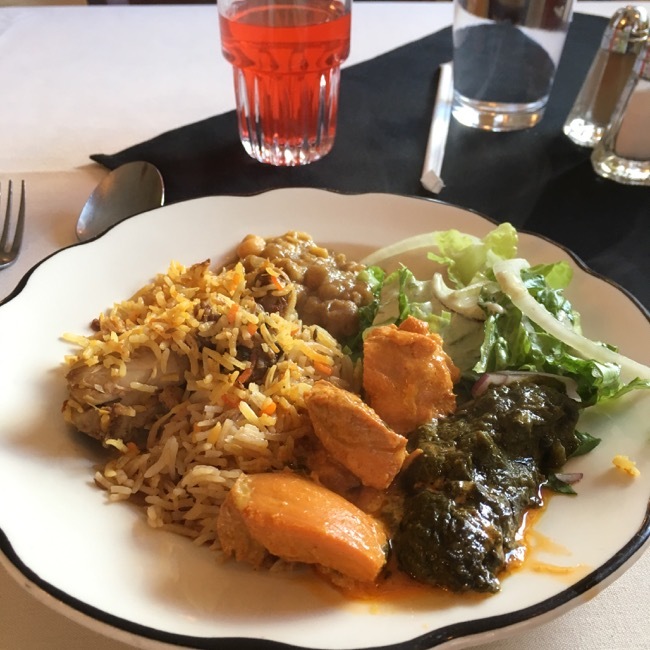 Some aalu palak (potatoes/spinach, cream and spices) dishes, chicken korma, chicken tikka, and some other stuff like Chicken Kebab and Chicken Tikka Boti sautéed in onions and bell peppers – which was fantastic. The only drink on offer was the pink stuff you see in my pictures. I don’t really know what it was, but it was clearly some rose water flavored stuff. I’m sure people love it, but I’m a weird who kind of hate the smell of roses, let alone the taste of them. As for the food, I devoured everything. 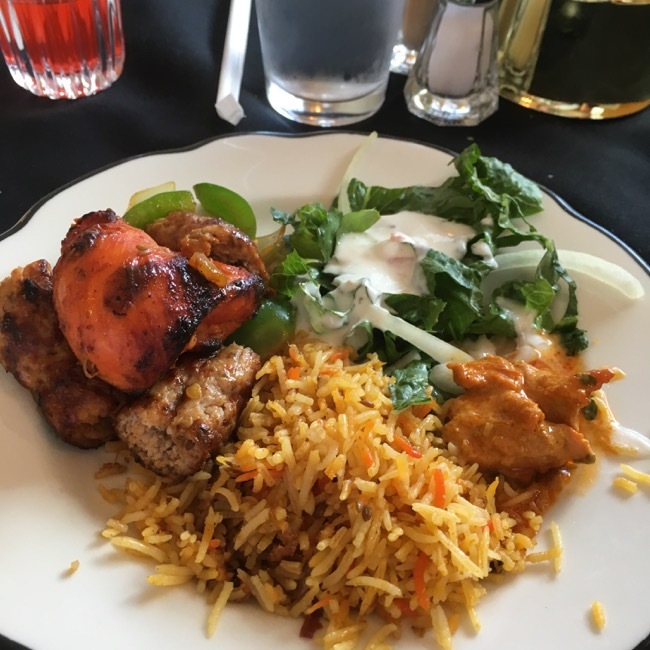 Buffets aren’t exactly the best way to judge a restaurant – and neither are naanwiches for that matter. But when I go to these “international food tour” restaurants for CTMQ, I’m not really going as a food writer or reporter. Because I’m not a food writer or reporter. Heck, I can’t even tell you what makes this place Pakistani vs. Indian. I’m just that doofy 44-year-old suburban Anglo Saxon dad interested in trying new things. There were a bunch of Persian/south Asian people dining when I was having lunch, so that’s always a good sign. 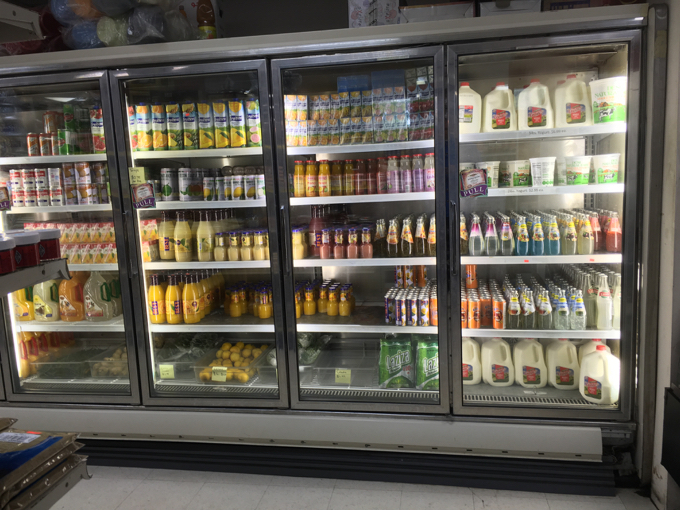 They’ve been in business – at least on the convenience store side of things – for 20 years, which is another good sign. And I thought it was all pretty darn delicious, which is the only sign I really care about.